We are manufacturers and exporters of High-Quality Flex Printing Machines from New Delhi, India. Our Flex Printing Machines includes Digital Flex Printing Machines, Head Flex Printing Machines, Konika Flex Printing Machines, Konica Head Flex Printing Machines, High-Speed Flex Printing Machines, Large Format Flex Printing Machines, Flex Printers etc. Our Flex printing machines are widely used in various kind of Flex & other printing & able to maintain industry standards. Colorjet is one of the largest manufacturer and exporter in INDIA. POLO TURBO is high-speed quality SOLVENT PRINTER with unique specialty 4H-30PL-512iKM. Konica Minolta Japanese 512i 4 print heads for both Flex and Vinyl. RIP software ONYX (Color Jet edition). Solvent based pigment inks, 4 colors. Motorized pinch roller and Capping system. Colorjet is one of the largest manufacturer and exporter in INDIA. 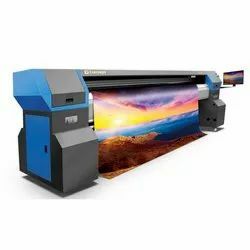 IRISJET is high speed quality with OUTDOOR BANNER PRINTER unique specialty 4H-42PL-1024KM. Printing speed 915 sq.ft /hour. Printing resolution maximum 1440 dpi. Colorjet is one of the largest manufacturer and exporter in INDIA. POLO TURBO is high speed quality SOLVENT PRINTER with unique specialty 8H-30PL-512iKM. Konica Minolta Japanese 512i 8 print heads for both Flex and Vinyl. Solvent based pigment inks , 4 color. Colorjet is one of the largest manufacturer and exporter in INDIA. IRISJET PRO is high speed quality HIGH SPEED SOLVENT PRINTER with unique specialty 4H-30PL-512iKM. Printing speed 1232 sq.ft /hour. Dimension 4500 mm*1000 mm*1450 (L*D*H). Colorjet is one of the largest manufacturer and exporter in INDIA. NEPTUNE is high speed quality KONICA HEAD FLEX PRINTER with unique specialty 4H-42PL-512KM. Konica Minolta Japanese 512, 4 print heads for Flex and Banner. Solvent / mil solvent inks , 4 color (CMYK). Colorjet is one of the largest manufacturer and exporter in INDIA. NEPTUNE is high speed quality DIGITAL INKJET PRINTER with unique specialty 8H-42PL-512KM. Konica Minolta Japanese 512, 8 print heads for Flex and Banner.